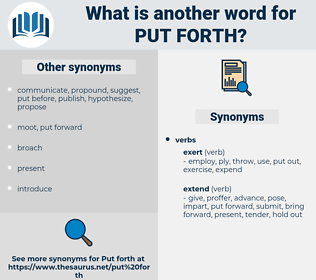 What is another word for put forth? conceal, ignore, relax, rest, laze, hide, idle. 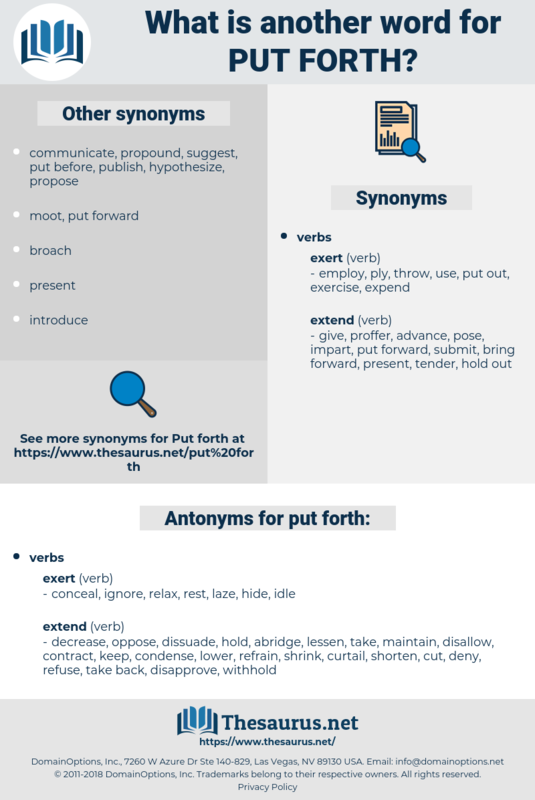 decrease, oppose, dissuade, hold, abridge, lessen, take, maintain, disallow, contract, keep, condense, lower, refrain, shrink, curtail, shorten, cut, deny, refuse, take back, disapprove, withhold. discourage, stop, withdraw, withstand, veto, fight, resist. neglect, question, listen, keep secret, retain, suppress, praise, ask, request, be quiet, fail, disclaim. halt, reject, abstain, mismanage, let go, renounce, repudiate, cease, misuse, save, leave alone. disavow, disprove, break, condemn, discredit, invalidate, desert, refute, contradict.